released Burleigh Grimes: Baseball’s Last Legal Spitballer. This is going to come as a shocker to you Chippewa Valley, but where I grew up, in the St. Croix Valley, we don’t have nearly as many famous people as you do. The few famous people from there are icons of the community; they also provide something to talk about when you are sitting across from strangers at the many Lutheran church chicken dinners. And, that’s pretty nice. 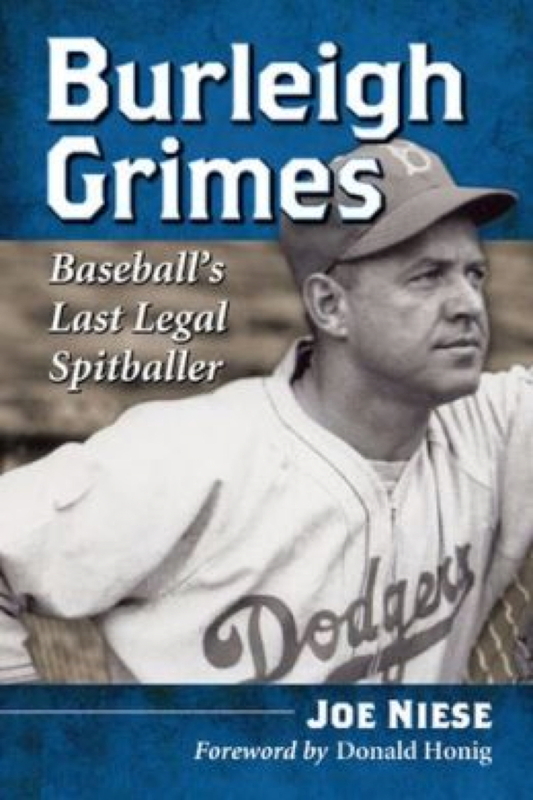 So, when I heard that Joe Niese wrote a new book, Burleigh Grimes: Baseball’s Last Legal Spitballer, I simply had to interview him about it. Burleigh Grimes, is one of those icons from the St. Croix Valley. Grimes is Baseball Hall of Fame inductee whose career spanned almost 50 years and included stints with seven major league teams and a career as a manager and scout. He is also from Clear Lake, which is only a few miles down the road from where I grew up. What drew you to write a book about Grimes? My initial draw to Grimes was that he started his professional career in Eau Claire. I’ve written a number of articles on the history of baseball in the Chippewa Valley.While researching one of those, I came across a substantial piece on Grimes in Jerry Poling’s A Summer Up North, which not only chronicles Hank Aaron’s time playing ball in Eau Claire, but also the history of baseball in the city. Grimes was integral to the Clear Lake community throughout his life. What do you think it was that built such a strong connection with Clear Lake as opposed to many of the other neighboring towns in his part of St. Croix and Polk counties? Although he was born in Emerald, in St. Croix County, Grimes always called Clear Lake his hometown; despite never actually living “in town” until later in life. Honestly, I think it came back to baseball. 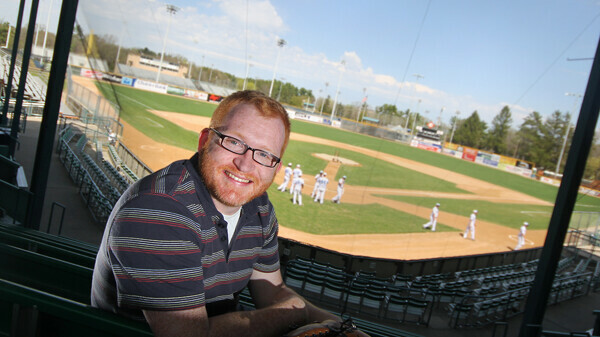 His father was the manager of the Clear Lake Yellow Jackets and Burleigh was the team bat boy at a very young age. His allegiance to Clear Lake came through that. Did you travel to Clear Lake to write the book; if so did that make the story of Grimes feel more “real” to you? I did travel to Clear Lake a number of times to visit the Clear Lake Historical Museum and speak with the curators, Charles and Ardeth Clark. The Clarks were close friends with Grimes and were integral to the finished product. They gave me open access to scrapbooks, pictures, and artifacts, as well as some fun stories to add some color. Undoubtedly, it made writing the story more “real” to be able to hold these items and sit in the Clarks’ den and be able to look across the street at the house Grimes lived in his later years. It never failed, every time I drove up there, I had butterflies the entire trip. I also want to say if people get the chance, visit the Clear Lake Historical Museum. It is open a few days a week, Memorial Day to Labor Day. Not only does it have a room dedicated to Grimes, but there is also one for Gaylord Nelson, Clear Lake’s other favorite son. Do you think there is a lesson in your book about loving your community even when you are separated from it, both geographically and professionally? Can you describe Grimes’ version of the spitball? What made his so unique that he is often cited as the father of it? Grimes’s version of the spitball was somewhat different than his contemporaries. Like most spitballers, he made some type of movement to his mouth in between pitches, whether he was going to throw a spitter or not. As you may recall from the book, I likened his delivery to squeezing a watermelon seed. It was delivered with great pressure, which often caused broken finger nails. It also made it particularly difficult to control. I think he may be called the father of the spitball, because of his status as the legal spitballer. Later in life, he became the go-to person when discussing the pitch. Do you have anything else you want the public to know about your book? I’m obviously very proud of it. It has been out less than a month and I’ve already gotten some very good feedback, which is extremely humbling. I recently heard from my publisher that they already had to do a second printing, after the initial run of 500. Not bad for a somewhat obscure baseball player from the early 20th century. For more information on Burleigh Grimes: Baseball’s Last Legal Spitballer, visit JoeNiese.com. The book will be featured in the Chippewa Valley Book Festival in October. If you are interested in finding out more about Clear Lake and Grimes, take a drive due northeast. It’s only a few miles up the road, and Lutheran church chicken dinner season is approaching.